This guide contains information on features that are new to the Version 4.0 release of Boris Continuum Complete AVX (BCC AVX). This document only provides an overview of the many new features. For more detailed information, see your Boris Continuum Complete AVX User Guide. The Boris Continuum Complete AVX User Guide is available as an online pdf ﬁle found on your Boris CD-ROM. The Boris CD-ROM also includes PDF Release Notes, Tutorials and Understanding OpenGL documentation. Consult these documents for the latest information. The following new integration features have been added to BCC AVX version 4.0. BCC AVX now works with Avid set to 8-bit-per-channel and 16-bit-per-channel color processing; 16-bit mode makes a larger range of colors available. To render BCC ﬁlters in 16 bit, set this preference in the Render tab of Avid’s Media Creation Settings window. See your Avid documentation for details on setting the color depth options. When you work with high-resolution images that use a narrow range of colors, such as gradients for ﬁlm effects or HDTV output, 16-bit mode preserves more detail and transitions between colors display less banding. You can choose to work in 8-bit or 16-bit-per-channel mode for each project. BCC AVX automatically uses the color depth that is set in your Avid preferences. Some ﬁlters do not support 16-bit color, for example Star Matte. The OpenGL ﬁlters (BCC Glare, BCC Glint, BCC Glitter, BCC Lens Flare, BCC Lens Flare Advanced and 3D Extruded Image Shatter) are 8-bit only. They still render if your system is set to 16 bit. However, they will render as 8 bit. The AVX 2.0 architecture allows plug-ins to take advantage of Avid’s advanced keyframe model. 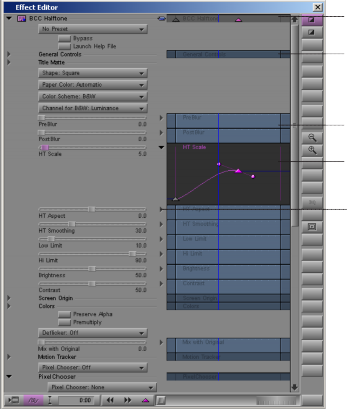 The advanced keyframe model lets you set keyframes for individual parameters in the Effect Editor window. Instead of being limited to Linear interpolation, you can now set a keyframe’s interpolation to Shelf, Linear, Spline or Bézier. For details on Avid’s advanced keyframe model, see your Avid documentation. top of the Effect Editor window. New to this version, clicking the Launch Help File button opens the PDF documentation for the current ﬁlter. The online Help ﬁles have also been improved in this release. Each Help ﬁle now includes links to separate Help ﬁles on the General Controls, Title Matte, Geometrics, Drop Shadow, Motion Tracker and PixelChooser parameter groups. Previously these parameter groups were only documented in the User Guide. existing presets then appears in the menu. New to Version 4.0, parameters in the General Controls, Geometrics and Drop Shadow parameter groups are now saved with the preset. This feature is not included in your Avid documentation. See Chapter 1 in your User Guide for details on this feature. Most ﬁlters contain a Title Matte parameter group that allows you to apply ﬁlters to Avid titles or mattes without affecting the background.A new menu has been added to this parameter group to provide more ﬂexibility when working with imported images. The Title Alpha menu determines how the image’s alpha information is used. Choose Straight if you are applying a ﬁlter to a title created in the Avid Title tool. Straight displays the portion of the image deﬁned by the alpha channel. Choose Premultiplied Black or Premultiplied White for images whose alpha channels are premultiplied with a solid black or white color respectively. This choice is appropriate for imported images. When you set the Title Alpha menu to Premultiplied Black or Premultiplied White, you must select 601/709, non-square in the Image Settings window. You can access this window by clicking the Options button in the Import dialog box. For more information on applying BCC effects to Avid titles or matte keys, see Chapter 1 of your User Guide. The Motion Tracker parameter group allows you to track the motion of an object in a media ﬁle. You can then use the motion path data to control another aspect of the effect. The parameters that can be affected depend upon the ﬁlter. For example, apply a Blur ﬁlter to a clip and use the Motion Tracker parameters to track a logo on a t-shirt. Apply the Blur to obscure the logo. In version 4.0, the Motion Tracker includes a number of improvements that increase the accuracy and efﬁciency of tracking. You can now process your image to improve the tracking results using the parameters in the Preprocess parameter. For example, you could increase the contrast for better results. You can also specify which channel to track and deﬁne a tracking range. You can also reﬂects the background image around the edges of a foreground image to creates the illusion that light from the background is reﬂected onto the foreground image. This creates a more convincing composite by making it appear as if the images were shot in the same environment. See Chapter 1 in your User Guide for details. The PixelChooser’s Region parameters specify an area in which to apply a ﬁlter. In previous versions of BCC AVX, you could use a region-based matte as a garbage matte, then combine it with a channel-based matte. New to this version, the PixelChooser option that creates an animatable vector-based mask now includes bézier handles for more precise control. Choosing Custom from the Shape menu lets you draw your own custom mask using onscreen controls. Instead of simply creating a garbage mask, you can now create animating masks with adjustable bézier handles. The shape you draw is animatable and can include up to 40 points. You can also combine multiple shapes. You can drag points to reposition or animate them; Shift-select to reposition multiple points. The number of points is not animatable. See Chapter 10 of your User Guide for detailed information. Boris Continuum Complete for AVX includes seven new ﬁlters. In addition, hundreds of new presets have been added. Boris Continuum Complete for AVX includes the following new Color & Blurs ﬁlters. For details on these ﬁlters, see Chapter 2 in your User Guide. BCC Color Match simpliﬁes the process of matching the color or luma values of two clips in the timeline. For instance, if two clips with different lighting conditions are edited together, the clips color and luma values will differ. Match Color automates the process of removing or balancing the difference between the two clips by setting color or luma values for the highlight, shadow and midtone areas of the image. Boris Continuum Complete for AVX includes the following new Distortion & Perspective ﬁlters. For details, see Chapter 3 in your User Guide. The BCC Corner Pin ﬁlter allows you to map media to a speciﬁc area on a moving object in a media ﬁle. For example, suppose your movie includes a moving bus with an advertisement on its side. You could use Corner Pin to track and replace the advertisement with a logo. The ﬁlter provides a variety of explosion, velocity, and gravity parameters to control particle movement. In addition, 3D Image Shatter has a number of parameters that allow you to control the particle size, rotation, opacity, lighting, and explosion style. This ﬁlter is auto- animated by default, but you can manually animate it for more precise control over the movement and dispersion of the particles. You must have a supported OpenGL card and driver to use the BCC 3D Extruded Image Shatter ﬁlter. For information on supported conﬁgurations, see the Understanding OpenGL PDF on your Boris CD. Boris Continuum Complete for AVX includes the following new Effects ﬁlter. For details on this ﬁlter, see Chapter 4 in your User Guide. Boris Continuum Complete for AVX includes the following new Keys & Matte ﬁlter. The BCC Motion Key ﬁlter allows you to isolate and remove a moving foreground object based on motion estimation. You deﬁne the object that you want to remove. For example, you have a static shot of some buildings and a car passes by on the street in front of the buildings. You could use this ﬁlter to remove the car and replace it with the buildings. Boris Continuum Complete for AVX includes the following new Time ﬁlter. For details on this ﬁlter, see Chapter 8 in your User Guide. The Optical Stabilizer ﬁlter allows you to stabilize shaky video footage. The Optical Stabilizer uses optical ﬂow technology to analyze a speciﬁed region and then adjusts the track’s position to compensate. Unlike many stabilizing tools, the BCC Optical Stabilizer does not require you to set user-deﬁned tracking points. This is useful for images where tracking data is unreliable. During playback, the motion appears smooth because the track moves incrementally to offset the unwanted motion. You can also stabilize just a portion of a track to correct isolated camera bumps. The BCC Optical Stabilizer ﬁlter appears in the Time category. The following changes have been made to the existing BCC AVX ﬁlter set. The Acceleration parameter has been removed from all ﬁlters. In previous versions, Acceleration adjusted the interpolation of parameters between a Linear-style and an Ease In/Out interpolation type to create more natural animation by accelerating parameter changes. This parameter is no longer necessary as Avid’s Advanced Keyframing model now allows you to do this. The DV Size Media checkbox has been removed from the General Controls parameter group. This checkbox automatically corrected an Avid problem rendering 720x480 DV media. Avid has corrected this problem, so this checkbox is no longer required. The Rebuild Param Cache checkbox has been removed from the General Controls parameter group. This was used to force certain ﬁlters to rebuild the parameter cache. This problem has been corrected, so the checkbox is no longer required. The BCC Glint, BCC Glitter and BCC Glare ﬁlters now correctly work with alpha channels. This means that you can apply the ﬁlters to a title and have the light effects originate from the text. In previous versions, the light was constrained to ﬁll the text. As part of this ﬁx, the BCC Glitter ﬁlter includes a new parameter, the Glitter on Alpha Layer Only checkbox .